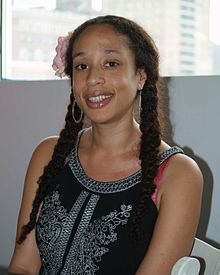 Alaya Dawn Johnson (born 1982) is an American writer of speculative fiction. Apart from short fiction, Johnson has published two urban fantasy novels about "vampire suffragette" Zephyr Hollis set in an alternate 1920s New York City, and two novels set on islands resembling pre-modern Polynesia where people have learned to bind elemental powers to their commands. Her 2013 debut in the young adult fiction sector, the standalone novel The Summer Prince, is set on a post-apocalyptic cyberpunk Brazilian arcology ruled by a nanotech-empowered matriarchy. Love Is the Drug, her 2014 stand-alone young adult novel, is set in Washington, D.C. and follows a prep-school student whose memory loss may be connected to a burgeoning global influenza pandemic. Johnson was born in Washington, D.C. She graduated from Columbia University in 2004 with a Bachelor of Arts in East Asian Languages and Cultures. Johnson lives in New York City. Junior Library Guild selection for The Summer Prince, Spring 2013. YALSA nominee for their BFYA list for The Summer Prince, 2013. Finalist for the 2011 Carl Brandon Society Parallax award for the novel Moonshine. Finalist for the 2011 Carl Brandon Society Kindred award for the novel The Burning City. Top Ten finalist for the 2010 Million Writers Award for the short story "A Song to Greet the Sun." Winner of the 2008 Gulliver Travel Grant from the Speculative Literature Foundation. Finalist for the 2006 Carl Brandon Society Parallax award for the short story "Shard of Glass." The Summer Prince. New York: Arthur A. Levine Books. 2013. They Shall Salt the Earth with Seeds of Glass 2013 "They Shall Salt the Earth with Seeds of Glass". Asimov's Science Fiction. Vol. 37 no. 1. January 2013. pp. 10–26. ^ "Wicked City". Publishers Weekly. 1 February 2012. Retrieved 25 April 2013. ^ Miller, Faren (21 August 2010). "Faren Miller reviews Alaya Dawn Johnson". Locus magazine. Retrieved 25 April 2013. ^ Kincaid Speller, Maureen (13 April 2011). "Racing the Dark and The Burning City by Alaya Dawn Johnson". Strange Horizons. Archived from the original on 12 October 2014. Retrieved 25 April 2013. ^ Mayer, Petra (7 March 2013). "Samba, Spiderbots And 'Summer' Love In Far-Future Brazil". NPR. Retrieved 25 April 2013. ^ Dobbs, Michael Ann (15 April 2013). "The Summer Prince takes us to a future Brazil with human sacrifice". io9. Retrieved 25 April 2013. ^ "Love Is The Drug". Kirkus Reviews. 30 June 2014. Retrieved 19 November 2014. ^ Valentine, Genevieve (27 September 2014). "'Love Is the Drug' For A Teen Caught In A Dystopian D.C." NPR. Retrieved 19 November 2014. ^ a b Johnson, Alaya Dawn. "About". Retrieved 25 April 2013. ^ a b "Nebula Award Winners". Retrieved 2015-07-20. ^ a b "2013 Nebula Nominees Announced". Retrieved 2014-02-25. ^ "2013 National Book Award". Retrieved 2014-02-25. ^ "2014 Rainbow List". Retrieved 2014-02-25. ^ a b c d e f g "Who I Am". Retrieved 2014-02-25. Wikimedia Commons has media related to Alaya Johnson.